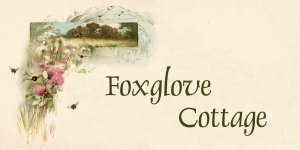 Foxglove Cottage produces the best hand sewing needles to be found anywhere. From Jeana Kimball. Foxglove Cottage Hand Embroidery/Redwork Needles are ideal for fine embroidery work. The needle's shank is not too thick yet the eye is large enough to accommodate two strands of embroidery thread. If you prefer to stitch with short needles you will enjoy using Foxglove Cottage Embroidery/Redwork Hand Needles. Foxglove Cottage Hand Quilting/Betweens Needles were designed specifically for traditional hand quilting done at a quilting frame or hoop. When using the traditional rocker method of hand quilting, the needle's short shank provides easy control. It is thicker than other needles, giving it added strength for moving through layers. Foxglove Cottage Sharps Hand Needles are best known as all purpose hand sewing needles. They are longer and finer than the Betweens/Quilting needle. They are also shorter and finer than Straw needles. Some prefer them for simple mending tasks, others like it for hand applique and hand quilting. Foxglove Cottage Straw Hand Needles are ideal for hand piecing and basting. Foxglove Cottage Longs Basting/Tying Hand Needles are used for tying quilts and basting a quilt's layers together prior to hoop or lap quilting. Foxglove Cottage Utility Hand Needles are the needle of choice for quilters using large stitches. A long, sturdy shank prevents the needle from bending, while the embroidery eye of the Utility Quilting needle allows for easy threading of perle cotton, crochet cotton, or yarn.